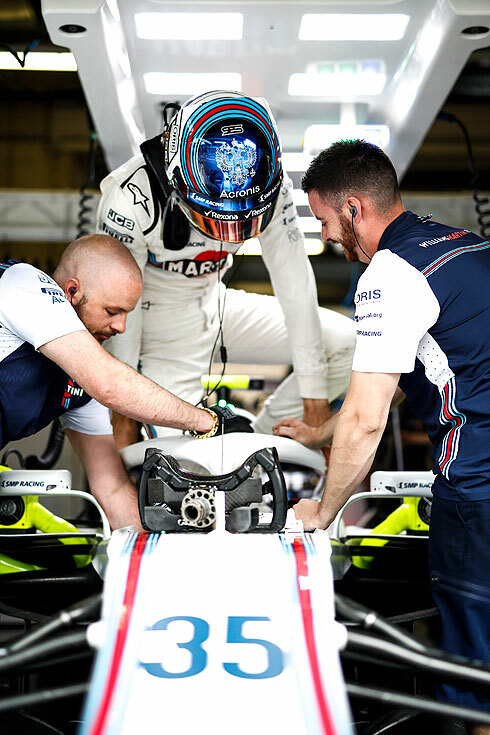 The opening Friday practice sesison for the 2018 British GP would see a session with different stories for the Williams Martini drivers. For Lance Stroll his session would see him finish in an encouraging 10th after constanly improving during the session. 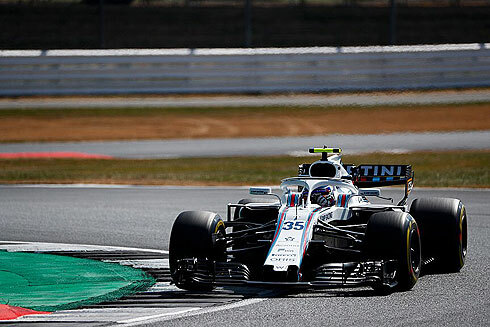 For team-mate Sergey Sirotkin his session was the exact opposite with Sergey having an off-track moment that would see him forced to pit for a consierable part of the session. With his lack of running he would finish 20th and last in the session. Hopefully he will be able to improve in the later Friday session. For the weekend the teams would have the hard, medium and soft tyres to choose from. There would be a three types used as the drivers completed their installation laps. The first timed lap would come from Hartley with a 1m:35.079 using the soft tyre. Gasly would go second but Verstappen would go to the top of the times with a 1m:30.863 running on the medium. More drivers started to come out including both McLaren's. Perez was now second with a 1m:31.671 using the soft tyre. Verstappen improved with a 1m:30.009 with Raikkonen now second. Vettel was now third followed by Perez and Ocon. Ricciardo was in sixth running the hard tyre. Verstappen had improved with a 1m:29.469 but Vettel would move ahead with a 1m:29.244. Raikkonen was third and Bottas now fourth. Hamilton would go quickest with a 1m:28.908 now followed by Vettel, Verstappen, Raikkonen, Bottas, Ricciardo, Ocon, Grosjean, Perez and Magnussen. The Williams drivers were 11th and 19th. With the first forty minutes just about completed the track would empty as drivers returned to return their set of Pirelli tyres. With the return of the drivers we would see Bottas go quickest with a 1m:28.143 while Hamilton had also improved with a 1m:28.153. Verstappen would move into third ahead of Vettel and Grosjean. But Ricciardo was now fourth but Grosjean would go off at Abbey Turn one. This would see the Virtual Safety Car come out. The car would be removed as Grosjean walked away. With just over twenty minutes remaining we would see the Williams of Lance in 10th. At the front Hamilton had gone quickest with a 1m:27.487 followed by Bottas and Vettel. Fourth was now Ricciardo, Raikkonen, Verstappen, Grosjean, Perez, Ocon and Lance in 10th. Seven minutes remaining and the Williams drivers were now 10th and 20th. Verstappen would be forced to stop his car on the pit straight having been told to stop and do not shift gears. The car would be recovered and shortly after the session would come to an end with the Williams drivers running close together prior to pitting. For Williams one driver had a very positive session but for the other a spin and an off-track moment would see him well down the times. One can only hope he will improve in the second session. Lance would use the medium tyre for his installation lap. Lance would say that the track was quite bumpy in places. While Sergey was lapping Lance would come out also on the soft tyre. Lance would set a 1m:32.363 to be 11th. He would improve with a 1m:31.688 to be 10th, dropping back to 11th.lance would continue to find time with a 1m:31.317 to now be 12th. A 1m:31.008 from Lance saw him now 11th. The team had lots of flow viz on the rear of Lance's car trying to understand what is happening. Lance would return to the track having dropped to 16th but was able ti improve again with a 1m:30.388 to now be 13th. Lance would again improve with a 1m:29.878 to now be 10th. Lance would pit after an eight lap run. Lance would return for a short run using the used soft tyres. Sergey would be first out for Williams running on the hard tyre for his installation lap. Sergey would return running on the soft tyre. A 1m:34.034 from Sergey would see him sixth dropping to seventh. But Sergey would go off at Club losing the car on the exit seeing the car go into the gravel. Again it was an example of how difficult the FW41 is. Sergey would pit after his off-track moment currently 12th. He would drop to 16th as the team checked his car. This would become 19th as he continued to stay in his pit. Sergey was able to get back out running on a new set of soft tyres. Sergey would set a 1m:31.033 only seeing him 18th. Sergey has green and pink flow viz on the rear of his car as he continued with his second run. He would drop to be 20th as he pitted after a 10 lap run. Sergey would also return using the used soft tyres.